In a starred review, Publishers Weekly called this YA mystery a "haunting psycological thriller" and "profound, provocative commentary on what it means to grow up in the age of Facebook." 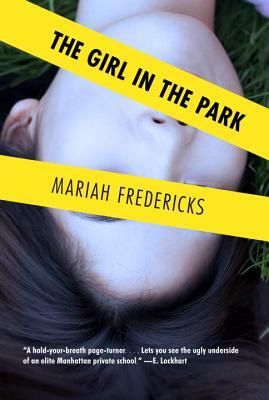 "[B]oth Rain and Wendy emerge as fully rounded, flawed characters that teens will recognize and connect with. A satisfying whodunit with enough clues and red herrings to keep mystery fans happy." "Fredericks has constructed a taut, suspenseful mystery with convincing characters whose actions and motives propel the plot. Rain is an unusual, compelling protagonist, a watcher who must step reluctantly out of her comfort zone. Observant readers...will find as much satisfaction in observing Rain’s personal growth as in the solving of the intriguing mystery." "The story starts off slowly, gradually building to a surprise ending. Rather than a heavy-handed explanation of Rain’s cleft palate, details are sprinkled throughout the story, building readers’ understanding of her communication difficulties and readers’ compassion for her." "The mystery unravels amidst a sensitive exploration of Rain’s coming to terms with her own quiet, demure personality, with its flaws and its advantages measured against Wendy’s extroversion and desire for recognition and love. The crime itself offers up multiple suspects before a triumphant resolution tinged with melancholy, a conclusion that highlights the fact that while growth is certainly possible, some people, unfortunately, never make it past the slights of high school." "As in her previous novels, Fredericks paints a perceptive picture of teens and their struggles with social pressures. Rain is an interesting protagonist to follow as she tries to overcome her own issues in order to defend her friend who can no longer speak for herself. Fredericks creates believable adult characters as well, which is too often not the case in teen novels. The very real mystery of the story is a riveting background for Rain’s self-struggle, and the plot twists make this a true page-turner. This book will find a ready audience in fans of Sarah Dessen and Deb Caletti who are looking for something a bit edgier."